Start by loading just the section of the rod that you need, to make your cast. One of the key essentials in fly casting has to do with stroke length. Your stroke length needs to be equal in proportion to the amount of line you have outside the rod tip. Every time you increase the amount of line outside the rod tip your stroke length should increase as well. So if you have to make a short quick cast then you need to have an equally short casting stroke. Depending on how much line you have outside the rod tip will depend on how deep the rod tip will load and store energy. It’s still a great idea to add a lot of power during this shortened stroke length to help increase line speed. Line speed is huge when casting in the heavy winds. Just a quick short casting stroke is all you need to form a tight loop and load the tip of your rod to make a short saltwater quick cast. 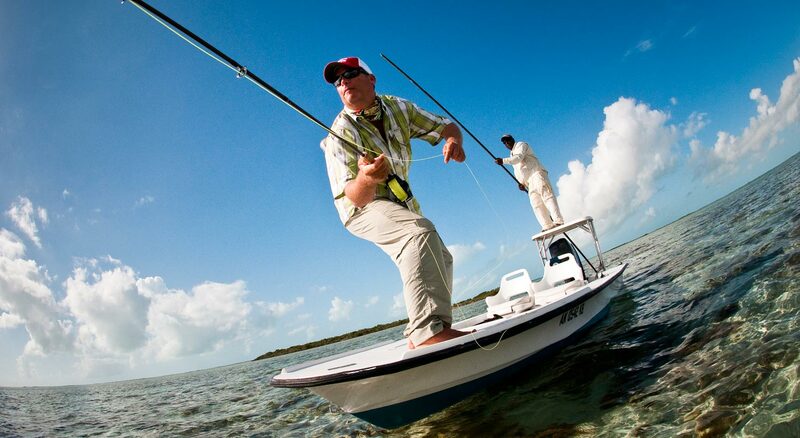 To have a successful quick saltwater short cast, being able to start your cast from the ready position is key. In the ready position you already have 10-12ft of fly line head outside the rod tip so the time needed to load just the tip with a short casting stroke of the rod is dramatically reduced. Heavy winds are prevalent in the salt. It’s these heavy winds that actually help us get closer to normally spooky fish. A powerful cast is needed to lay out even the shortest of casts into these types wind conditions. One thing that can help increase line speed to help cut into the wind is the type of grip you use when casting. There are a couple of popular grips in the salt, the V grip and the thumb on top grip. Each grip, combined with an aggressive wrist snap at the end of a short casting stoke, will add a ton of extra power to the system, helping your line to lay out straight into the wind. The thumb on top grip can offer up to 45 degrees of additional wrist-snapping power while the V grip can offer a whopping 90 degrees of wrist-bend power application, dramatically increasing line speed efficiently. Applying more power to your cast to help create line speed is important, especially when battling heavy winds. When making a short cast you don’t have much stroke length available to add power, so you have to apply power in other ways. Using your line hand and arm at the end of your casting stroke to apply additional power to increase line speed will help to roll out your leader straight with power to spare. Once your short casting stroke stops, the fly line passes the rod tip, forming your loop. At this time you can then add more power by fully extending your line arm behind you and snapping your line hand wrist. This movement will apply ample power to the presentation and help to present your fly with little slack. Put all of the pieces together and you’ll have a super effective short, quick cast that will definitely bring more fish to the boat. This entry was posted in Fly Fishing Tips & Technique, Saltwater Fly Fishing, The Hot Ticket and tagged A Short Quick Cast, bonefish, fishing, Fly Fishing, fly fishing lessons, Fly Fishing Photography, Gink and Gasoline, how to fly fish, how to fly fish saltwater, Kent Klewein, learn to fly fish, Louis Cahill, permit, photography, salt water fly fishing, Saltwater Fly Fishing, tarpon by Louis Cahill. Bookmark the permalink. Please explain a little more about using your line hand to improve a short cast. Once the rod tip stops, is the movement described for the line hand act as a brake, assuring the leader comes tight and increasing the chances that the fly turns over?